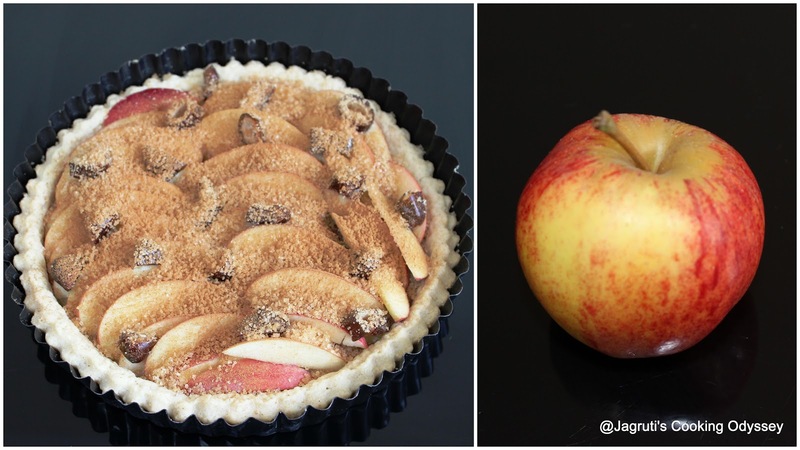 Jagruti's Cooking Odyssey: Quick Apple, Date and Cinnamon Tart ! Being a cook and foodie, when craving comes I could whiz up something in no time...I've done this numerous times.Cheeky, blowing my own trumpet :P . Not necessarily it would be healthy, it can be sugar loaded or artery clogging greasy dishes as well ! Rewinding life few days back, last weekend husband cooked mouthwatering and delectable north Indian dishes, daal makhni, jeera rice, aloo gobi and roti for us at lunchtime. It was well spiced and finger licking good and we all had seconds ! After a hot and spicy experience we all had cravings to sooth our taste buds and wanted something sweet. So all eyes came to my direction and expectations were that I now get up and make them a quick dessert. That led me to the idea of baking a quick apple, date and cinnamon tart, since I had all the ingredients at the ready. The ready made shortcut pastry was in the fridge, cooking apples and dates were lying around. Tart was ready in less than half an hour.It is very easy to make yet it looks beautiful and is wonderful to share with family. It is still a slightly healthy option to a sweet dessert. The sweet and fruity slice with the hint of cinnamon went down well with a dash of cream...! Line one 9" loose - bottom tart tin with the pastry and prick all over with the fork. Use your fingers to fold some of the overhanging pastry back over itself, to allow for shrinkage. Run your rolling pin firmly over the rim of the tart tin to trim the pastry. Pull away any excess overhanging pastry. Line with parchment and baking beans and bake blind for 10 minutes. Remove paper and beans and bake for 5 minutes. Meanwhile core the apple and sliced thinly. I did not peel the skin. Carefully place the thinly sliced apples and dates into blind baked pastry. 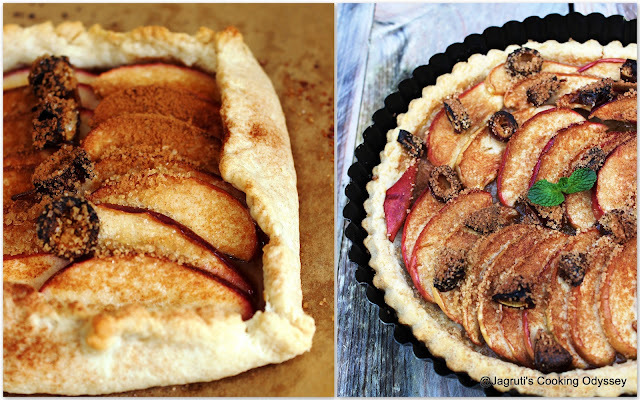 Sprinkle dermera sugar and ground cinnamon on top of the fruit. Turn gas mark on 6. Bake tart with fruit in the oven for another 10 minutes. Remove from the oven let it cool slightly and serve with cream, ice cream or on it's own. A very delicious sounding tart! I love the add of date. lovely tart with addition of dates in it. Great quote and lovely tart! What a great combination of ingredients/flavors. Wow looks delicious, yummy combo dear.